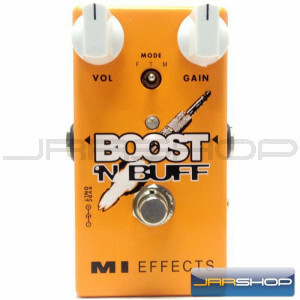 The Boost ‘n’ Buff is a booster and buffer pedal that should be an essential on every pedal board, whether to keep your original guitar tone intact or to boost the signal in three different ways. In bypass mode, it's an ultra-high (5MΩ) input impedance buffer, but in boost mode, the super-quiet, Class A transistor design can push out 35dB of pure power! The tri-function MODE switch allows for three boost options; FULL, TREBLE and MID and voltage multiplying circuitry takes the 9V input, and triples the internal voltage supply to provide more top-end sparkle, clarity and more headroom than most boost pedals on the market.